May | 2017 | Path to Portfolio — Chemistry Ph.D.
Bob and Dr. Daniel Fowler Head to Atlanta! GAANN Fellow Bob Carden will join Duke Chemistry lab manager, Dr. Daniel Fowler, in Atlanta for the 2017 Cottrell Scholars Collaborative National Teaching Assistant Workshop! The selection process was competitive and we are thrilled that Bob and Dr. Fowler were selected to attend! We look forward to hearing about new developments in Teaching Assistance career development as well as improvements to the higher education enterprise upon their return! Congratulations, Bob and Dr. Fowler! Posted in Uncategorized | Comments Off on Bob and Dr. Daniel Fowler Head to Atlanta! 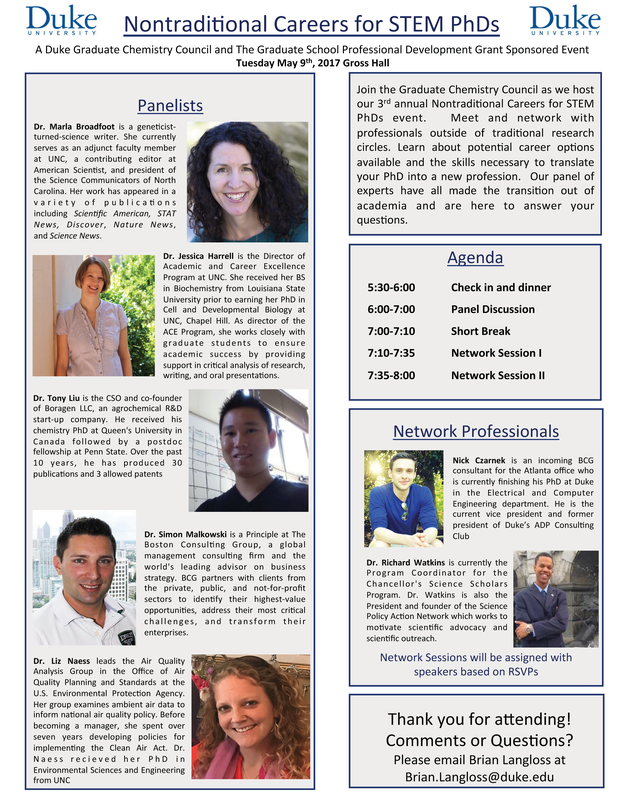 Join the Graduate Chemistry Council as they host the 3rd annual Nontraditional Careers for STEM PhDs event on May 9 at 5.30pm. Meet and network with professionals outside of traditional research circles. Learn about potential career options available and the skills necessary to translate your PhD into a new profession. Their panel of experts have all made the transition out of academia and will be there to answer your questions.